Dentigerous cysts are usually encountered in the practice of pediatric dentistry. The treatment modalities range from marsupialization to enucleation of the lesion and are based on the involvement of the lesion with the adjacent structures. However, loss of a permanent tooth in the management of a dentigerous cyst can be devastating to a child who has already a congenitally missing tooth. The first case describes the technique of marsupialization in which we extracted the grossly carious deciduous 1st molar and created a window through the extracted socket to decompress the lesion. In this case the 2nd premolars were congenitally missing on both sides of the mandible for which we had not gone for enucleation of the dentigerous cyst along with the developing 1st premolar. The second case is a developmental type of a big dentigerous cyst where marsupialization was followed by enucleation of the cystic lining but without removal of the affected tooth. Both the teeth erupted in the oral cavity. Dentigerous cysts are the most common of all developmental odontogenic cysts of the jaws and account for approximately 20-24% of the jaw cysts. They develop around the crown of an unerupted tooth by expansion of the follicle when fluid collects or a space is created between the reduced enamel epithelium and the enamel of an impacted tooth. 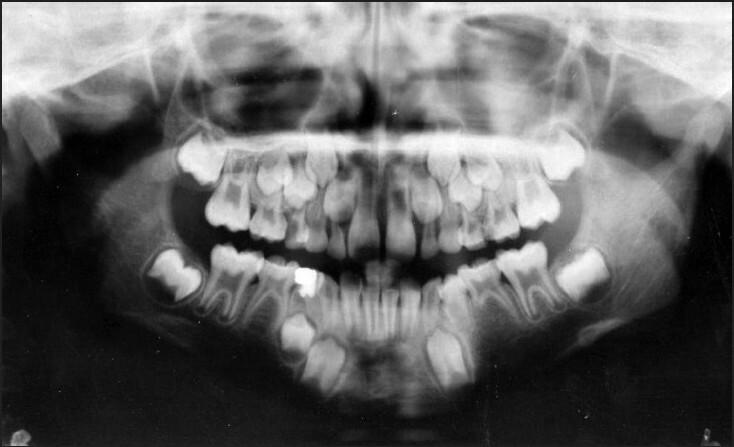 These cysts are always associated with an unerupted tooth or a developing tooth bud and are found most frequently around the crown of the mandibular 3rd molars followed, in order of frequency, by the maxillary canines, maxillary 3rd molars and, rarely, the maxillary central incisors. The cyst may cause swelling, teeth displacement, tooth mobility and sensitivity if it reaches a size larger than 2 cm in diameter. 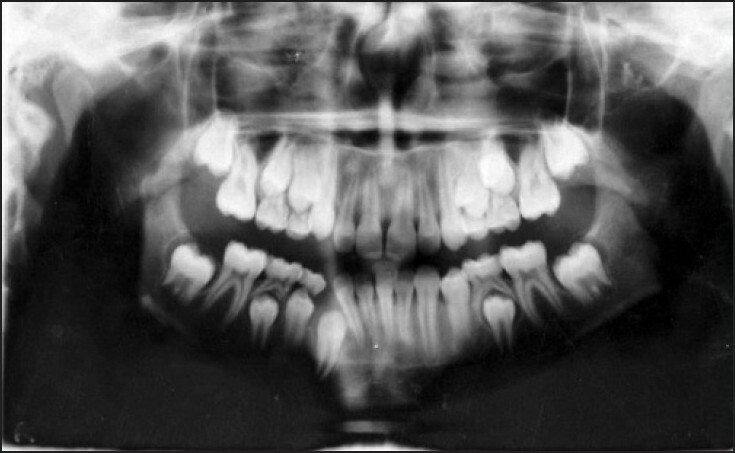 In the radiograph, the dentigerous cysts usually show a well-defined unilocular radiolucency, often with a sclerotic border, surrounding the crown of an unerupted tooth. Histologically, the dentigerous cyst consists of a fibrous wall lined by non-keratinized stratified squamous epithelium of myxoid tissue, odontogenic remnants and, rarely, sebaceous cells. If untreated, these cysts may cause pathologic bone fracture, impaction of the permanent tooth, bone deformation, ameloblastoma and development of squamous cell carcinoma or mucoepidermoid carcinoma. The treatment modality indicated for such a cyst is either surgical removal of the cyst, avoiding damage to the involved permanent tooth, or enucleation of the cyst along with removal of the involved tooth, or the use of a marsupialization technique. 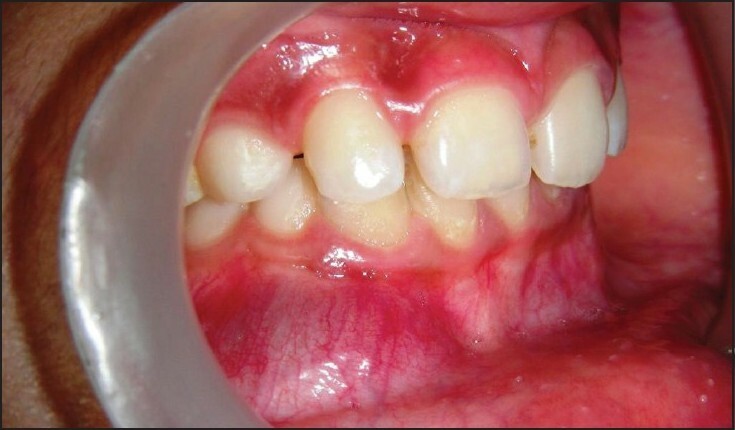 These cases presented here describe the management of dentigerous cysts in children in the mixed dentition. A 7-year-old male patient reported to the Department of Pedodontics and Preventive dentistry with a chief complaint of swelling which was enlarging slowly on left side of mandible since last 1 month, leading to facial asymmetry. The patient gave a history of intermittent pain in that tooth since more than a year, which used to subside on taking analgesics. On general examination, the patient was healthy and there was no other bony lesion or defect present in the body. There was no apparent history of past illness or hospitalization or trauma to the jaw. On extraoral examination, facial asymmetry was noted on left lower side of the face, with no sinus or active discharge of pus. The submandibular lymph nodes on the left side of mandible were enlarged, palpable, tender and mobile, which suggested chronic infection from the tooth. On intraoral examination, a hard swelling in 73, 74, 75 regions was found with obliteration of the buccal vestibule. The swelling was bony hard with expansion of the buccal cortex in #73, 74, 75 regions with no expansion of lingual cortex. There was a "typical egg shell cracking" found in #74 region which was grossly decayed. In the radiograph [orthopantomograph (OPG)], an oval-shaped, unilocular radiolucency was noticed around the developing 1st premolar with a radiopaque border. The deciduous 1st molar was grossly decayed with loss of bone in the bifurcation area. The mesial root of deciduous 2nd molar was resorbed by the radiolucent lesion. 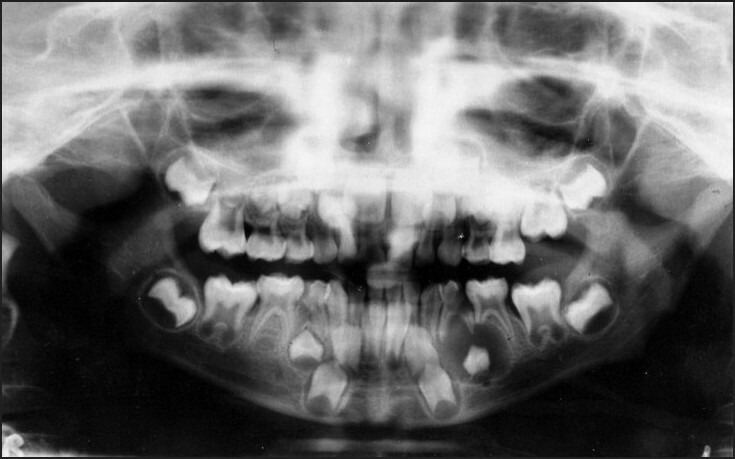 The mandibular 2nd premolars were congenitally missing on both sides [Figure 1]. The contents of the swelling were aspirated and sent for investigations which revealed thick blood mixed mucoid material. The cytopathologic examination of the aspirate showed mucoid material, RBC, clumps of benign epithelial cells and plenty of cyst macrophages. A provisional diagnosis of inflammatory type of dentigerous cyst was made on the basis of the above findings. Since both the mandibular 2nd premolars were missing, it was decided not to enucleate the cyst along with the developing 1st premolar. A preventive approach was followed to preserve the developing 1st premolar. Therefore, marsupialization of the lesion was planned through the extracted socket of grossly decayed deciduous 1st molar to create a window allowing continuous drainage of the cystic content. Prior to surgery, routine blood and urine examinations were carried out, the results were within normal limits. The cyst cavity was packed with sterile iodoform gauze to achieve hemostasis and to prevent hematoma formation. The iodoform gauze was changed on the third day. Follow-up examination revealed the followAfter 1 month, there was slight occlusal movement of the developing tooth bud, but there was no apparent reduction in the radiolucency [Figure 2]. After 6 months, there was further occlusal movement of the developing tooth and there was a huge reduction in the radiolucency. The root formation of mandibular left 1st premolar had started as well as bone formation was evident in the cystic cavity [Figure 3]. After 12 months, there was further occlusal movement of the tooth and there was almost complete reduction in the radiolucency. The root formation of mandibular left 1st premolar progressed to one third [Figure 4]. After 15 months, mandibular left 1st premolar had successfully erupted into the oral cavity with two-third root formation [Figure 5]. 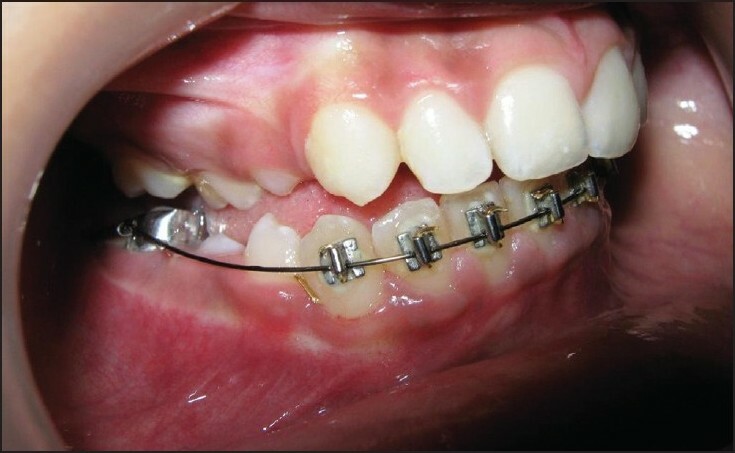 A 10-year-old female patient reported to the Department of Pedodontics and Preventive dentistry, with a chief complaint of swelling on right side of the mandible since last 20-25 days, which was enlarging slowly leading to slight facial asymmetry. On general examination, the patient was apparently healthy and there was no significant past medical history related to the development of the swelling. On extraoral examination, facial asymmetry was seen on right lower side of the face. The swelling was soft at the center surrounded by bony hard elevation. There was no sinus or active discharge of pus. No lymph node was palpable in this case. On intraoral examination, a soft swelling with respect to 42, 83, 84 regions was noted buccally with obliteration of buccal vestibule [Figure 6]. There was expansion of buccal cortex around the swelling but no expansion of the lingual cortex seen on palpation. The swelling was smooth (approximately 2 Χ 3 cm in diameter) with fluctuation positive at the center on buccal surface and there was slight mobility in 42 and 83 regions. The OPG revealed an oval-shaped, well-defined unilocular radiolucency extending from 42 to 84 regions with resorption of roots of deciduous canine and 1st molar. There was mesial displacement of the root of the mandibular permanent lateral incisor by the radiolucent lesion. The permanent canine was displaced to the lower border of the mandible with the crown pushed mesially. The developing 1st premolar was displaced distally [Figure 7]. The aspiration of the lesion showed thick, straw-colored, oily fluid. Cytopathologic examination of the aspirate revealed mucoid material with plenty of cyst macrophages. There was no epithelial cell or malignant cell seen on histopathologic examination. A provisional diagnosis of developmental type of dentigerous cyst was made based on clinical examination and radiological findings which was further supported by fine needle aspiration cytology (FNAC) report. As the size of the radiolucent lesion was large causing mesial displacement of the lateral incisor and distal displacement of the developing 1st premolar with mandibular right permanent canine pushed to the lower border of the mandible, our objectives were to reduce the size of lesion and to allow formation of new bone. This would prevent pathologic fracture of the jaw and root exposure of the lateral incisor if surgical enucleation of the lesion was performed. Therefore, at the initial stage, marsupialization was considered to minimize the damage of the affected teeth and jaw bone. The operation was performed under local anesthesia through the extracted socket of deciduous canine and created a window allowing continuous drainage of cystic contents. Prior to surgery, routine blood and urine examinations were carried out and the results were within normal limits. The cyst cavity was packed with sterile iodoform gauze to achieve hemostasis and to prevent hematoma formation. The iodoform gauze was changed on the third day. The patients were advised to maintain good oral hygiene and a chlorhexidine mouth rinse was prescribed for both of them. Follow up examination revealed the following. After 3 months, there was sign of healthy bone formation on the buccal surface. 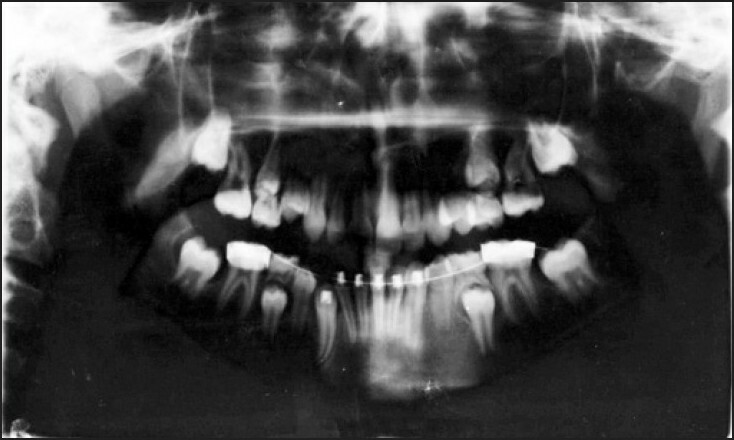 In the radiograph, the radiolucency had reduced to almost 50% and there was change in the angulation of the permanent mandibular canine from horizontal to a more vertical direction [Figure 8]. After 9 months, there was complete reduction in the radiolucent area with more vertical uprighting of the canine seen [Figure 9]. 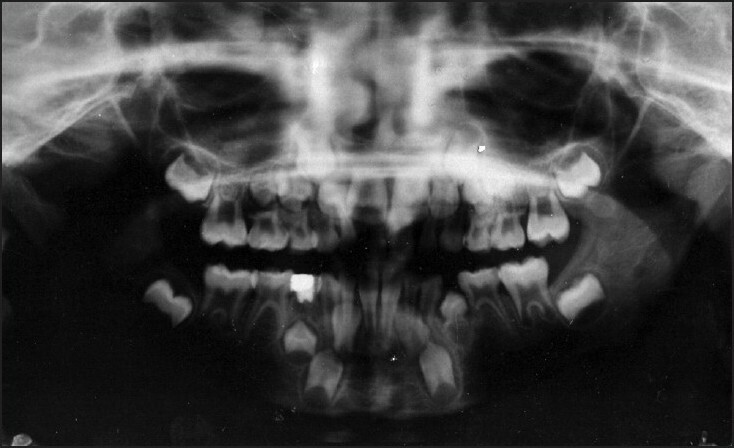 After 15 months, with minor orthodontic treatment, the tooth had erupted into the oral cavity [Figure 10] and [Figure 11]. There are two types of dentigerous cysts reported in the literature: developmental and inflammatory types. It is stated that the developmental type of dentigerous cyst is formed around the crown of an unerupted tooth by accumulation of fluid either between the reduced enamel epithelium and the enamel or in between the layers of the enamel organ. This fluid accumulation occurs as a result of pressure exerted by an erupting tooth on an impacted follicle which obstructs the venous outflow and thereby induces rapid transudation of serum across the capillary wall. The other theory of origin of developmental type dentigerous cyst stated that the most likely origin of the dentigerous cyst is the breakdown of proliferating cells of the follicle after impeded eruption. These breakdown products result in an increased osmotic tension and hence cyst formation. The origin of inflammatory type of dentigerous cyst is thought to be from the overlying nonvital necrotic deciduous tooth, as suggested by Bloch. The resultant periapical inflammation spreads to involve the follicle of the unerupted permanent successor; an inflammatory exudate ensues and results in dentigerous cyst formation. 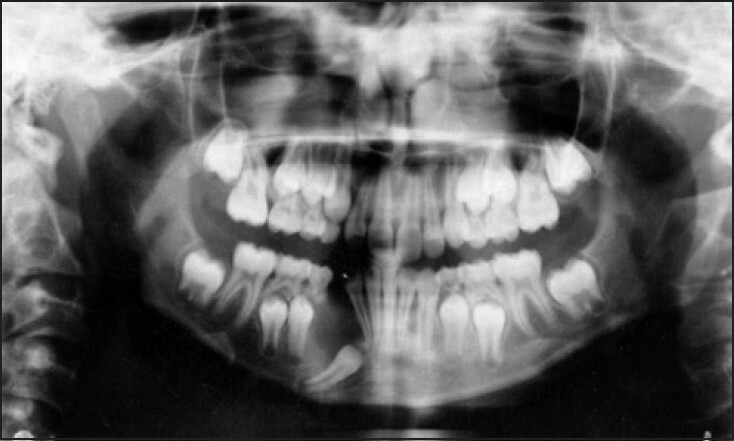 In this present investigation, the first case is an inflammatory type of dentigerous cyst originated from the nonvital primary mandibular 1st molar. The second case is a developmental type of dentigerous cyst in mandible associated with a permanent canine below a vital primary canine. In the differential diagnosis, a large periapical cyst, odontogenic keratocyst, central giant-cell granuloma, and unicystic ameloblastoma can mimic a dentigerous cyst. A radiograph does not differentiate between the various types of lesions as mentioned above which are associated with the root of a nonvital or a vital primary tooth involving the crown of a developing permanent tooth. Therefore, FNAC and histopathologic examination of the cyst contents and lining is a must for final diagnosis. Moreover, the epithelial cells lining the lumen of the dentigerous cyst possess an unusual ability to undergo metaplastic transition. Rarely, some untreated dentigerous cysts develop into an odontogenic tumor (e.g., ameloblastoma) or a malignancy (e.g., oral squamous cell carcinoma). To avoid such complications, marsupialization and surgical enucleation of the cyst lining may be the treatment of choice for such a cyst. Marsupialization, decompression, and the Partsch operation, all refer to creating a surgical window in the wall of the cyst, evacuating the contents of the cyst, and maintaining continuity between the cyst and the oral cavity or maxillary sinus or nasal cavity. It is a technique that attempts to relieve intracystic pressure through the creation of an accessory cavity. This technique is selected since it is a more conservative intervention for the treatment of large cysts, especially in pediatric dentistry where there is frequent proximity of these lesions to the developing permanent tooth buds. In this investigation, the first case was that of a 7-year-old boy who had congenitally missing 2nd premolars on both sides of the mandible, which led us to preserve the affected tooth. We had planned not to enucleate the lesion along with the developing permanent tooth but to preserve it through marsupialization technique. In this case, marsupializations only led to successful eruption of the permanent tooth along with complete ossification of the bony defects in 15 months. We are closely monitoring the patient as he comes from a nearby area. There is no sign or symptom of developing ameloblastoma or other malignancy in that area or other parts of the body since the last 5 years. The second case was that of a 10-year-old girl with a huge dentigerous cyst involving permanent canine in mandible. In this case, initially we had gone for marsupialization of the cyst through the extracted socket of the deciduous canine. After considerable amount of bone was formed, we had done enucleation of the cyst lining only. In this case, the impacted permanent canine became vertical from horizontal position in 9 months. The radiolucency of the cystic defect had been completely resolved. This tooth erupted into the oral cavity after minor orthodontic traction. The successful preservation and eruption of the affected teeth in this present investigation may be attributed to the active growth potential and remodeling of bone in children unlike in adults where jaw growth is completed. The old adage "A stitch in time saves nine" holds true especially in pediatric dentistry where early diagnosis and proper treatment can save an affected tooth. Although marsupialization is an unconventional method of treating dentigerous cyst in adults, it is a very effective method in treating dentigerous cyst in children where there is always approximity with the developing tooth buds in the jaws. This method is very much useful in treating such cysts when there are already congenitally missing teeth for which we can save the affected teeth for chewing, speech, maintenance of occlusion and overall health of the growing child. 1. Ikeshima A, Tamura Y. Differential diagnosis between dentigerous cyst and benign tumour with an embedded tooth. J Oral Sci 2002;44:13-7. 2. Ziccardi VB, Eggleston TE, Schnider RE. Using fenestration technique to treat a large dentigerous cyst. J Am Dent Assoc 1997;128:201-5. 3. Bodner L, Woldenberg Y, Bar-Ziv J. Radiographic features of large cysts lesion of jaws in children. Pediatr Radiol 2003;33:3-6. 4. Tuzum MS. Marsupialization of a cyst lesion to allow tooth eruption: A case report. Quintessence Int 1997;28:283-4. 5. Chakraborty A, Sarkar S, Dutta BB. Localized disturbances associated with primary teeth eruption. J Indian Soc Pedod Prev Dent 1994;12:25-8. 6. O'Neil DW, Mosby EL, Love JW. 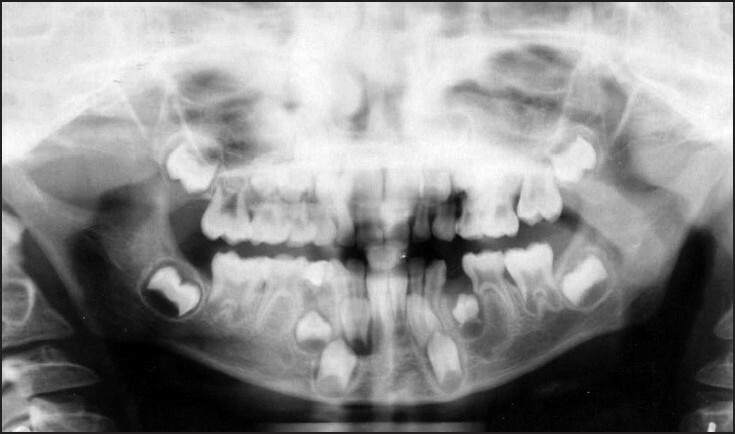 Bilateral mandibular dentigerous cyst in a five year old child: Report of 3 cases. ASDC J Dent Child 1989;56:382-4. 7. Main DM. The enlargement of epithelial jaw cyst. Odontol Revy 1970;21:21-9. 8. Toller PA. The osmolarity of fluid from the cyst of jaw. Br Dent J 1970;129:275-8. 9. Bloch JK. Dentigerous cyst. Dent Cosmet 1928;70:708-11. 10. Slootweg DJ. Carcinoma arising from reduced enamel epithelium. J Oral Pathol 1987;16:479-82. Soliman, M.M. and El Dayem Hassan, H.A. and Elgazaerly, H. and Sweedan, T.O. Dos Santos Pinheiro, R. and Castro, G.F. and Roter, M. and Netto, R. and Meirelles Jr., V. and Janini, M.E. and Primo, L.
Picciotti, M. and Di Vece, L. and Parrini, S. and Pettini, M. and Lorenzini, G.
Albanese, M. and Procacci, P. and Sancassani, G. and Nocini, P.F. Hadziabdic, N. and Sulejmanagic, H. and Selimovic, E. and Sulejmanagic, N.